My mother’s one and only cookbook growing up was the BH&G red checked cookbook. That book had a special spot above the stove in our kitchen cupboard for years. I think this recipe was one of the first (besides lasagna) I attempted as a young girl. Here’s the great thing about this recipe. If I was a betting woman- ( I mean real Vegas betting, which I’m not, which is really surprising, because my dad loved gambling, and my mom loves, I mean LOVES slot machines, which btw, I loved one time, on one day back in 1989, when I put a dollar coin into a slot machine on a cruise ship and won $100. I took my winnings and walked away, bought an outfit. Grant couldn’t believe it. He said – “Seriously, you are just going to walk away?” Well, yes, I won something, isn’t that what you are suppose to do?? ) oh- anyway, odds are 🙂 you have everything in your kitchen right now to make this yummy coffee cake. The term for this is a “no shop recipe”. Did you know that? I didn’t. It simply means you already have everything in your kitchen/pantry to make this. It’s simple, easy on the budget and yummy. Perfect to take to a neighbor or friend who could use a treat. Still love it to this day. I bet you and your family will love this too. Happy Monday! Mix the first 4 cake ingredients in a bowl. Make a well in the center, and add the wet ingredients. Mix just until all ingredients are incorporated. Pour into a greased 8 or 9 inch cake pan (round or square). Place brown sugar, flour and cinnamon for streusel into a small bowl. Cut butter into dry ingredients. Add chopped nuts, or more flour if omitting nuts. Crumble topping over batter . Bake at 350 for about 30-40 minutes, or until toothpick inserted in center comes out clean. Serve warm. Hi, just put the coffee cake in the oven! The batter was very firm and sticky, no way was it going to pour into my pan. I added a little bit more milk and then spread it into the pan. I used pecans in my streusel. 8 minutes to go…lookin good, smells great! It looks yummy. It's good, the streusel didn't fall into the cake as much as I thought it would. The cake is moist and sweet. I will make it again without pecans. 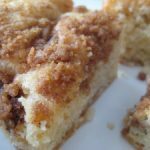 This is one of the easiest, convenient, and quick coffee cake, especially when you're having company. I always have what I need on hand whenever I want to make it. The one thing I did add to mine was 1 teaspoon of vanilla. To use a 9” pan you must double the cake batter. I followed this recipe exactly and it was an epic fail in the larger pan. I’m sorry to hear that, Judy. Thank you for sharing.